Beauty Breakfast – Anyone Hungry? How much do you take care of your face? 1. After using Aveeno makeup wipes to get rid of my makeup, I wash my face with the Imortelle Precious Cleansing Foam from L’occitane. 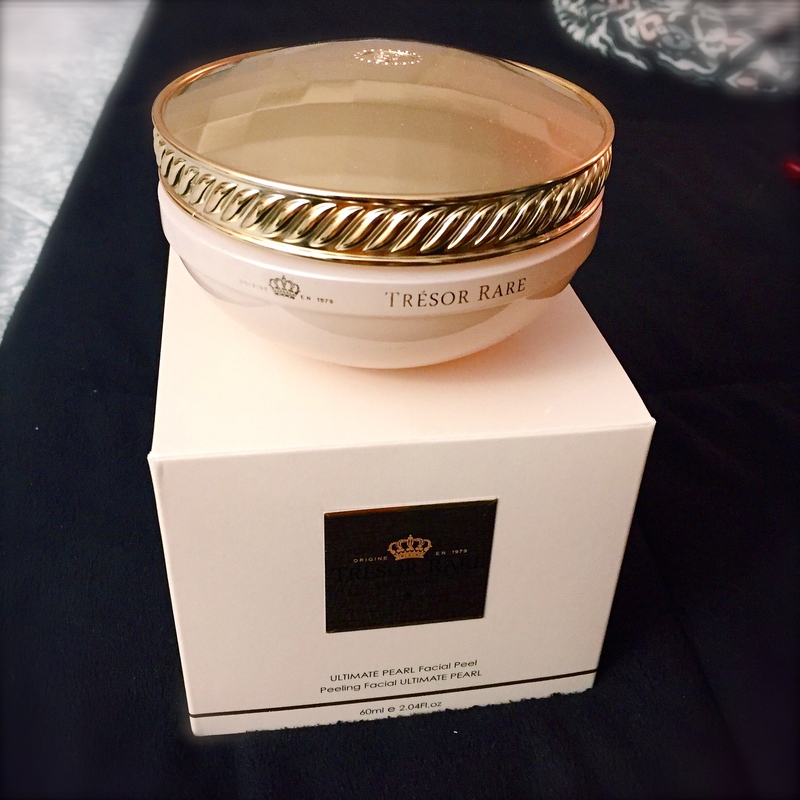 Once a week, I use a Facial peel by Trésor Rare which consists of diamond powder, pearl powder, and salt from the Dead Sea. It is very expensive but worth it as it has no harsh beads to irritate the skin. It is rather just a peel that you can gently move your fingers around in circular motions to help shed a healthy layer of dead skin cells in order to clear the pores and exfoliate in a non-abrasive way. 3. Next, I apply L’occitane’s all natural Divine Youth Oil (Pictured with Cleanser) – remember, a little bit of this goes a long way. 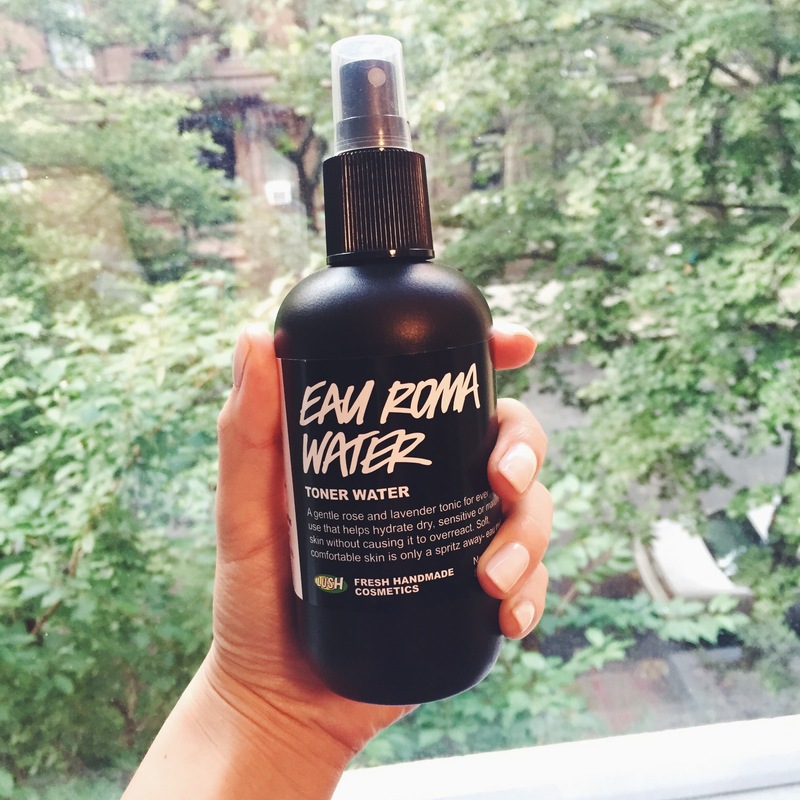 Sometimes, I use a face serum before I put on my lotion, but I am trying out this product for the first time, and so far, I am in love. My skin really feels like it’s locking in moisture and there is definitely more of a glow to my face. The Divine Youth Oil is also available at Nordstrom, Sephora, and on Amazon. 4. Now, it’s Lotion time. 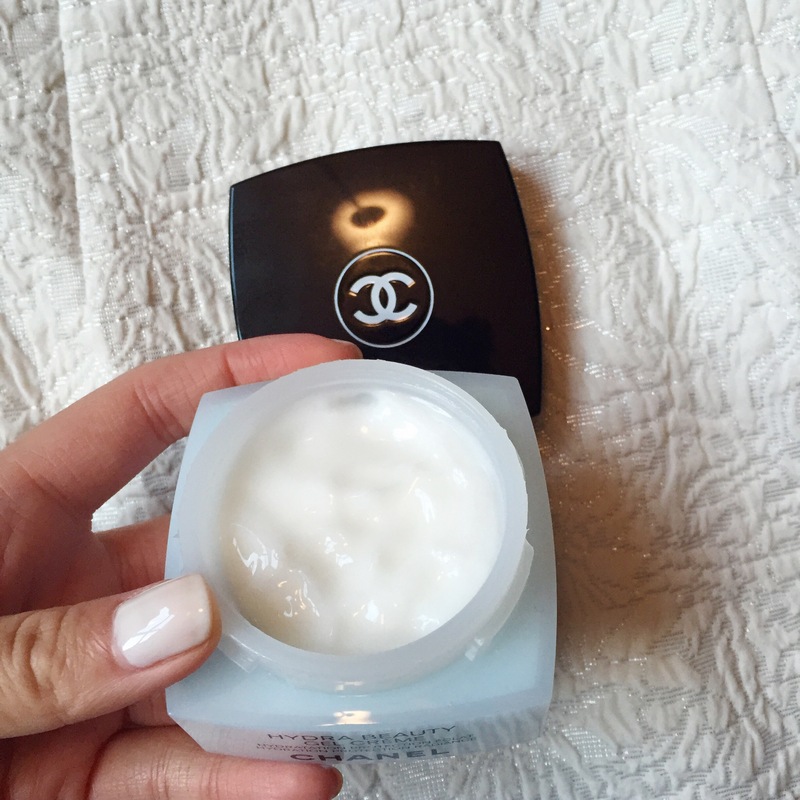 I use Chanel’s lightweight gel cream and apply a couple of dots around my face and then pat the rest of lotion all my face. Also good to note, patting is a great way to give your face a little massage to help maintain tautness of the skin. I try not to rub lotion into my face too often, as it may facilitate the creation of premature wrinkles and loosen the elasticity of the skin. 5. 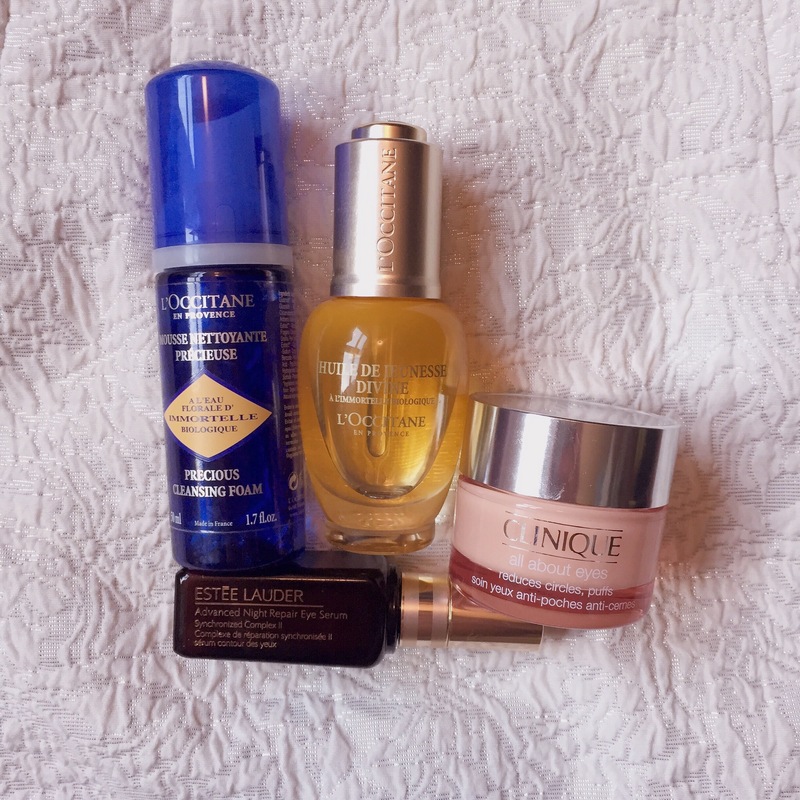 Lastly, I apply Estée Lauder’s Advanced Night Repair Eye Serum (pictured with L’Occitane’s Cleanser) under my eye area – it lightens and brightens the areas under my eyes. Usually, most women will use one eye regimen, but saggy eyes runs on my mom’s side, so I tend to use more products to help alleviate my bags! (Sometimes, I even use an inexpensive over-the-counter Garnier de-puffing gel that has a roller ball which feels ah-mazing). I then apply Clinique’s All About Eyes under my eyes and a bit on my eyelids. This is by far my favorite eye treatment I have ever used. I see a complete difference if I do not use this for a couple of days and when I do. When I do, the puffiness in my eyes reduces drastically. Boom. Love. And that’s it! 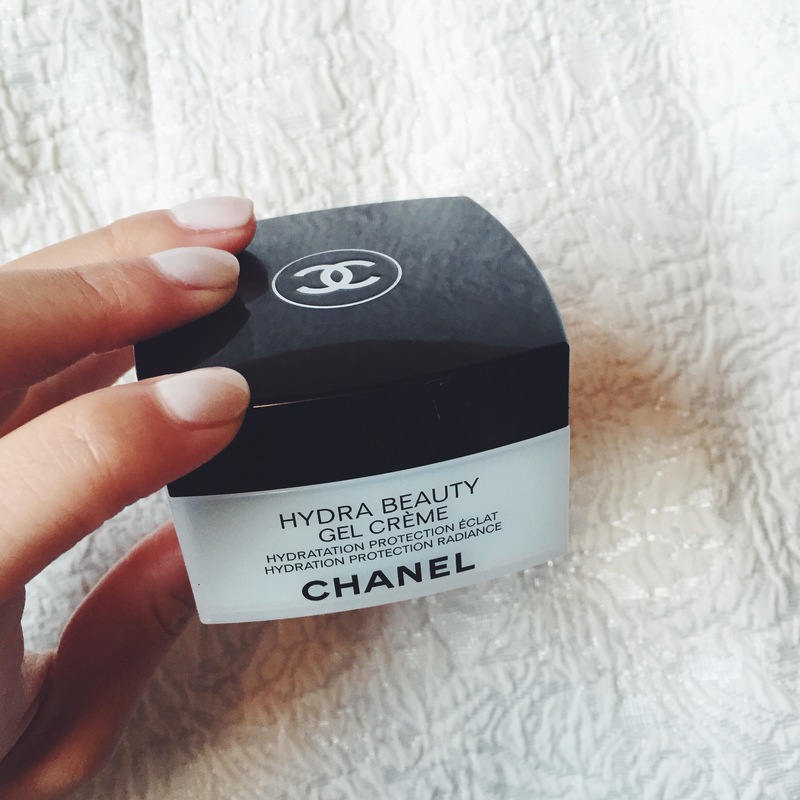 My nightly regimen is similar, I just replace the lotion with Chanel’s Le Lift Cream which is available in many department stores. Feel free to leave comments and let me know if you try any of these out!